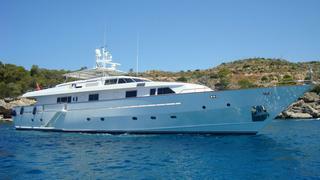 The 37.7 metre motor yacht Good Bye has been listed for sale by Jeremy Comport at Camper & Nicholsons. Built in aluminium by Italian yard Codecasa, Good Bye was delivered in 1992, offering comfortable long range cruising abilities. She has a five cabin layout accommodating up to 12 guests in a master suite situated forward on the main deck, a large VIP suite located aft on the lower deck plus two doubles and a twin guest cabin, all with full en suite facilities. The main deck saloon on this yacht for sale is decorated in a nautical theme and offers comfortable cream-coloured settees and a formal dining area. The covered aft deck has a table and chairs for idyllic al fresco entertaining and dining. Up on the sun deck, there are vast areas for soaking up the sun or curling up with a good book under the shade of the Bimini top. Twin 2,200hp MTU engines give her a cruising speed of 19 knots. Good Bye is asking €3,750,000.